The Vought-Sikorsky VS-300 (aka the S-46) is a historically sginificant single-engine experimental helicopter. The VS-300 is widely accepted as the first viable American helicopter design. It’s also the first in the world to use a single engine. The previous successul single-lifting rotor prototype, the TsAGI-1EA, made use of two engines and was of Russian origin. The VS-300 made a tethered flight in 1938 and a free flight in 1939. The VS-300 pioneered the single anti-torque tail rotor design we all know today. The TsAGI-1EA in contrast had double-sided anti-torque rotors on both the nose and tail. The prototype intially had a 75 horsepower (56 kilowatt) engine, but later a 90 horsepower (67 kilowatt) Franklin 4AC-199-E engine was used. The final VS-300 power plant was a 150 horsepower (112 kilowatt) Franklin engine. The airframe of the VS-300 consisted of a tubular welded framework. The cyclic control system of the VS-300 was initially similar to modern helicopter design, but Sikorsky found that it didn’t perform well. The cyclic of the main rotor was then locked and two small side-mounted auxilliary rotors were installed on the tail boom to handle that aspect of movement. As the problem of main-rotor cyclic control was solved, these small rotors were later removed. Given its status as an early helicopter, the performance of the VS-300 is impressive. It could fly at 80 kilometers per hour, cover 121 kilometers of terrain and endure 90 minutes of flight. It truly was a practical aircraft and was even viable for cargo movement. 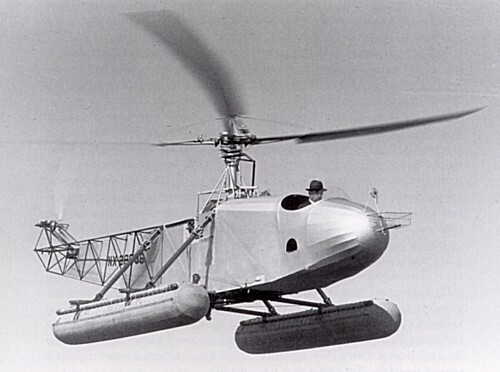 The VS-300 is also notable for being the first practical amphibious helicopter, after Sikorsky equipped it with float pontoons and successfully landed and took of from a water surface in 1941. The prototype was retired in 1943 and to this day remains in the Henry Ford Museum in Dearborn Michigan. Do you want to comment the Sikorsky VS-300 helicopter?